Search Results for "dish soap"
Closeup of pink, yellow, and blue paint being squeezed into milk, follow by dish soap. The dish soap causes the paint to move and spread apart. An experiment that shows how blue and pink paints in milk react to vegetable oil and dish soap. The oil moves the milk and creates paint bubbles, while the dish soap causes the paint to spread outwards. Blue, black, yellow, and tan paint are added to milk. Oil is added next causing bubbles, followed by dish soap which makes the black move to reveal the colors underneath. Teal, navy, and yellow paints are poured into milk. Next, dish soap is added, causing a reaction that makes the paint colors expand and repel. Pink, yellow, green, and blue paints are poured into milk. Then, vegetable oil and dish soap are added, causing bubbles to form and the paint to move around. 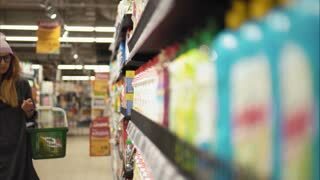 Yellow, green, tan, dark blue, and light blue paints are squeezed into milk. Then, oil and dish soap are added in, causing the colors to move around. A cool mysterious pool of black paint magically clears up to show white when dish soap is added. Next, tan paint is added followed by vegetable oil. 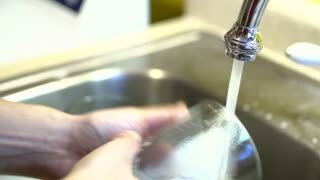 Washing a pan in the sink with water and dish soap. There's bubbles and a brush is used. Green and blue paints are poured into milk. Oil is added next causing bubbles, followed by dish soap which makes colors spread around. Dish soap causes an awesome reaction that makes a colorful mixture of yellow, green, pink, and blue paint move, swirl, and expand. Soap suds dripping from a newly washed dish positioned in a dish rack. 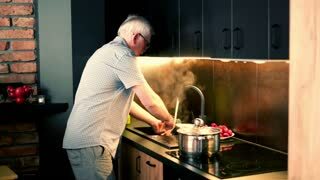 Man hand washing a bowl close up,Slow motion 4K . 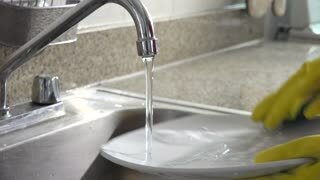 Wiping around kitchen sink with rag. 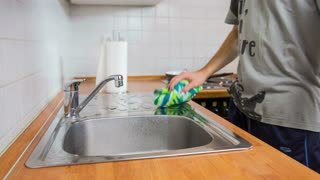 Close up of male person with green rag wiping water around kitchen sink after cleaning dishes. Person wipe out disheware after cleaning close up. 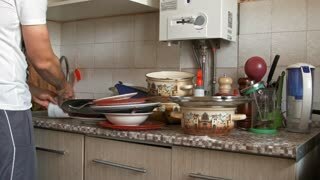 Male person wipe wet plates and kitchenware after cleaning under water in kitchen.